AS PREDICTED, WE had more fun that should be allowed Saturday at Second String Music's second anniversary celebration. We started jamming at about 9:30 am and we finally kicked Pepper Sprayers Tim Smith and Laura Sievert out the door around 7 pm, or something like that. 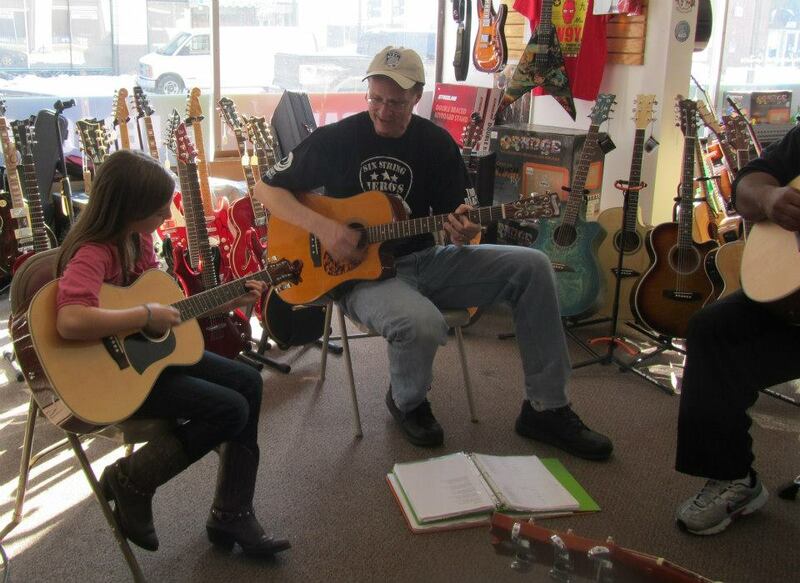 Sara Heiden of Blue Cross/Blue Shield made a donation to Six String Heroes, this one for more than $3,000. We toasted our friend Pat Cornwell several times, and legends like Jack Inghram, Jeff VanKanegan and Warren Riley showed up to tip a few back. Avery, left, showing the old guy how it's done! 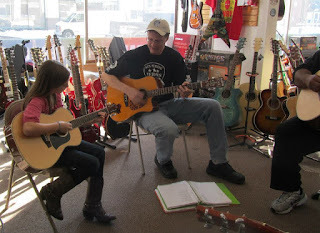 My favorite part was jamming with a couple of my guitar students, including Kristen Martin and Avery Alexander. They have come a million miles since struggling to reach that dreaded G chord or trying to play the bottom strings of an F. It was especially awesome to see Laura sit right next to Avery and showing her how to lead the charge. I've said this many times, but there is not a thing better than seeing eight people sitting in a circle jamming away, and nobody knows anybody, and nobody cares because it's so much fun. Sheryl and I are humbled and grateful for two great years. Now we get ready for the March 9 Six String Heroes bash at Turner Hall. Phew!